Posted on Sat, Apr 7, 2012 : 12:50 p.m. 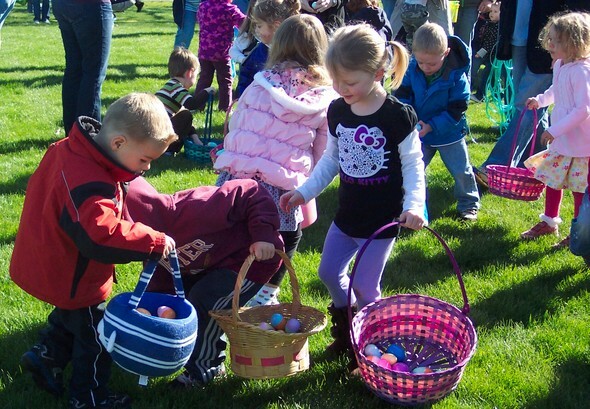 It took just minutes for children toting baskets and bags to find all the eggs hidden in Community Park in Dexter on Saturday morning. Hundreds of children filled Community Park in Dexter on Saturday morning for the second annual Easter egg hunt. The blue tarps still covering many homes in the tornado-ravaged Huron Farms subdivision just behind the park were simply a backdrop to the colorful Easter eggs that covered the park's grassy field. "This is a great opportunity to see the community in a different light," said Kathleen Root, whose husband, Lee Root, is a firefighter for the Dexter Area Fire Department. "This is a good outpouring of people to support getting together on a positive note." "I'm enjoying that the sun is out," said Root's 8-year-old daughter, Emily. The Easter Bunny was a popular attraction for children attending the event. The pleasant weather and festive atmosphere gave a welcome sense of normalcy to a community that suffered devastating damage when a tornado struck on March 15. While the damage to homes and businesses was extensive, the outpouring of support since then has helped bolster the community. "I thought I'd rather come to Dexter than any place, knowing that they're dealing with this tragedy," said Gwen Alexander, who lives in Ann Arbor. She said she was surprised to find out that it was the adjacent Huron Farms neighborhood that received so much damage. The Easter egg hunt was a three-generation experience for Alexander. She came to the event with her grandchildren, 4-year-old Collin McLelland and his 1-year-old sister Reese, along with their mother, Gretchen McLelland. The McLelland family was visiting from Chicago. "I like bunnies!" said Collin McLelland. Real rabbits of various colors and sizes were a big draw. Paul Cousins, a member of the Dexter Rotary Club, which was helping out at the Easter Egg Hunt, said the beautiful weather contributed to the large crowd. One of his fellow Rotarians posed as the Easter Bunny and attracted lots of children. 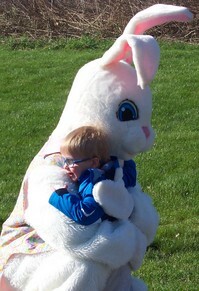 "This is their first time meeting the Easter Bunny," said Yvonne Schmidt, who recently moved to Dexter with her family. Her 3-year-old daughter Summer said, "I liked petting the rabbits." When it was time for the Easter Egg hunts, there was no time to blink. An enthusiastic basket and bag-toting crowd scarfed up the eggs in a matter of minutes. Sun, Apr 8, 2012 : 5:45 p.m.
Perhaps the children should have searched for tornado rubble instead of Easter eggs.